← Grass Pants is Going to Tyria! Bittersweet. It’s an interesting feeling and one I haven’t felt so strongly since Madoka ended. 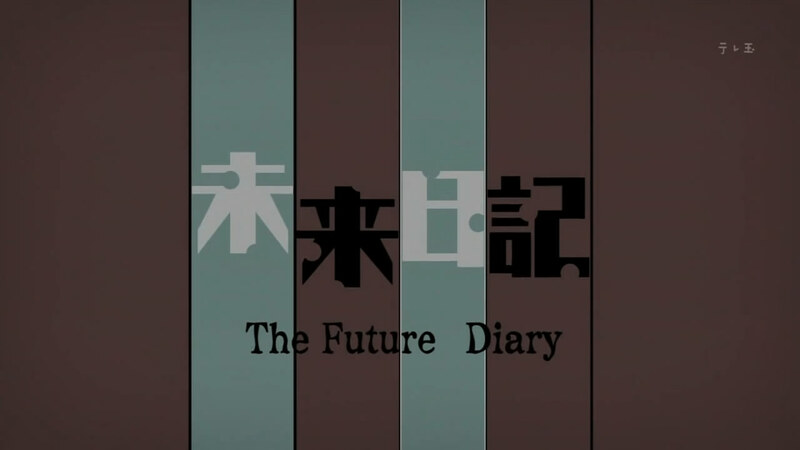 I have to say, it’s been a hell of a ride, so hit the jump for my full take on Mirai Nikki, because I think I can say it’s one of the most satisfying things I’ve seen in a while. As always,spoilers are to be expected beyond this point so go watch it if you’ve got the time. Wow. That ending was… Wow. I’m a sucker for ‘Where are they now’ scenes and seeing the Third World (which Yuno didn’t get to completely ruin by throwing the survival game into effect there) made me so incredibly happy. The entire final arc, the one where Deus died and Murmur took over, was just all around great. Ninth coming back to punch the everliving crap out of Murmur was crazy and awesome and I loved it. Also we got to see third and twelfth’s faces and they apparently became reasonably-decent acquaintances how cool was that?! But it wasn’t all punching out horrible abominations and a gay dude kissing a boy (huge props for keeping that scene in, by the way). No, Mirai Nikki also had the capacity to be absolutely heartbreaking. Yuno realizing just how twisted she’d become really hurt to watch, especially considering that she seemed to be unable to stop it. She was completely beyond help at that point. She knew she was a monster and yet she was going to kill her Third World self in order to start the cycle all over again because, well… She never knew a good, happy life. The only moment of pure bliss she had, ironically, was right before she died. The ‘real’ ending with a ten-thousand-year-old Yukiteru god was… disappointing in a few ways. First, I really wanted to see what happened to his world. We saw that it was barren just briefly, but was humanity wiped out? Did he truly rule over nothingness? Maybe a few scenes of him walking the shattered earth would have helped. Also the post-credits bit with ‘Yuno came to visit me’ was a bit off. I would’ve liked the series to end with Yukiteru ruling over nothing (or nothing he truly cared about anyway), but maybe they won’t balls it up too badly. Anyway, I’ve got elder dragons to slay, so I’m going to wrap it up. Again, feel free to join me in Guild Wars 2 this weekend if any of you guys want. As always, thanks for reading and have a good’un. This entry was posted in Anime and Manga, Review and tagged mirai nikki anime, mirai nikki final impressions, mirai nikki review. Bookmark the permalink.